Our state budget is a reflection of what we value most. It is also the mechanism through which we accomplish things that benefit us collectively. This includes helping provide the programs, services, and infrastructure that make our economy possible and that we all depend upon such as roads and bridges, education, and public health and safety. One way we can think about our budget is that it is the blueprint for the New Mexico we wish to create. With it we can anticipate and prevent future problems that we know will affect the well-being of our state. We also use our budget to address many of the state’s current problems, such as unemployment, poverty, drug addiction, and crime. All budgets are simultaneously reliant on the past and must look toward the future. For example, many of the roads, water lines, and schools that we use today are the result of investments we made in past budgets, and many of the investments we make today will still be paying off in years to come. The children we educated just a generation or two ago are the workforce of today just as the children we educate today will be the workforce of tomorrow. So if a good public budget is one that plans for the future and for the unexpected, good taxes are those that allow a community to pay for the public goods and services for which it has planned. 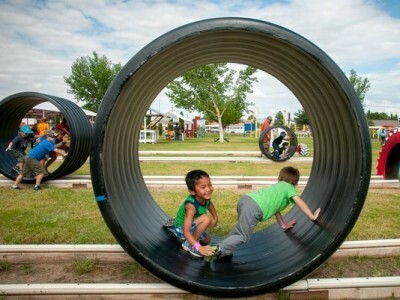 However, New Mexico seems perennially to rank at or near the bottom of the 50 states in many indicators of child, economic, and overall well-being. Given this standing, it is clear that we must improve the quality of life for everyone. This work begins when we invest in our strengths and resources—especially our human capital. New Mexico has a long and varied history of meeting problems head on with ingenuity, resourcefulness, and hard work. New Mexico has unique strengths—diverse cultures, strong traditions, and abundant natural resources—that we can build upon to improve our economy and overall well-being. 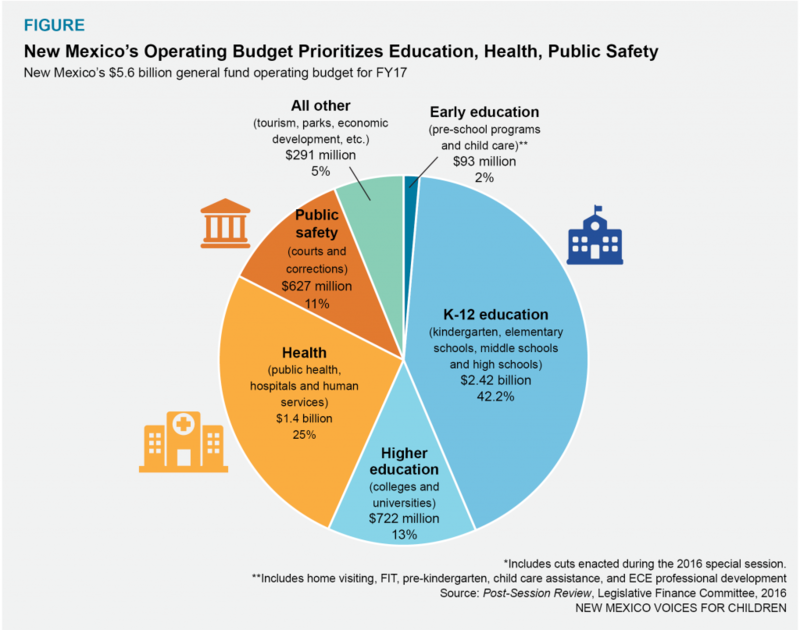 When looking at New Mexico’s budget it is clear that we value education, health care, and public safety, as those are the three largest spending categories. The process by which lawmakers decide on these spending priorities—and how the rest of us can influence those decisions—may seem pretty murky to most people. But do not fear! This guide seeks to de-mystify the creation of the state budget. We’ll start with a quick overview of the various state budgets (there’s more than one) as well as the funding sources. Then we’ll examine the executive and legislative processes for creating the budget. There are several steps that we will not examine closely—particularly how the various state agencies come up with their own budgets. You can find more on that in the companion guide, Advocate’s Guide to the New Mexico State Budget. This guide also provides suggestions for advocates on how to promote their priorities throughout the budget process. Another companion guide, Citizen’s Guide to New Mexico’s Tax System, explains more fully where the state gets its money. Words that appear in boldface are defined in the Technical Terms and Budget Basics boxes. Acronyms used in this guide are written out in the box below. Our state spends money in two ways: directly and indirectly. Indirect spending means the state has chosen not to collect certain tax revenue. This “spending” takes the form of tax credits, exemptions, and deductions. Once these changes to the tax code are enacted, they remain in effect indefinitely unless they include “sunset” or ending dates, or they are repealed. For the past several years, New Mexico has relied on indirect spending—by enacting tax cuts for special interest groups and profitable corporations—in an effort to grow our economy. Not only has this strategy been an utter failure, it has also taken a great deal of money away from our direct-spending priorities. In order to move forward, we need to do better at collecting the revenue we need to invest in New Mexico. Direct spending—the money spent on public services and programs such as education, public safety, and transportation—must be approved annually by the Legislature and signed by the governor. State spending helps drive our economy. The vast majority of state spending ends up in the private sector either directly or indirectly—directly when the state purchases goods (like raw building materials, paper, computers, etc.) and services (construction crews, school bus drivers, etc. ), and indirectly through the paychecks of public employees (teachers, public safety officers, etc.). The Medicaid program is a good example of direct government spending. Just 3 percent of Medicaid funds go toward the state’s administration of the program. The vast majority pays the salaries of private-sector doctors, nurses, and their many technicians and staff members; helps maintain and stock private-sector hospitals and doctor’s offices; and goes to pharmacies, pharmacists, and their support staff. The list goes on. State spending ends up in the economy indirectly when public employees spend their paychecks in the private sector on things like rent or mortgage, groceries, gas, car insurance, entertainment, and just about everything else we use and enjoy in our daily lives. In this way, the state plays an enormous role in the economy. Just like the national economy, the state’s economy is impacted by the business cycle, which experiences either growth and expansion or stagnation and recession. During a recession, the state collects less money in the way of taxes because business is sluggish, unemployment goes up, and people’s salaries are frozen or their work hours are cut back. State universities and colleges also experience higher enrollment as people seek to develop new skills or earn a degree. All of this tends to put a strain on state spending. Unlike the federal government, which prints and coins its own currency, state constitutions do not allow states to spend more money than they take in or have borrowed. During an economic downturn states are tempted to cut back on their spending, but when states drastically cut their spending, the economy is further weakened. Businesses that have contracts with the state lose out, and may have to lay off workers. Public employees who lose their jobs no longer have money to spend at local businesses. As unemployment goes up, personal spending goes down and the downward spiral continues. With public spending such a big and necessary element of the economy, we must find a way to continue investing in our state. Most of the state’s money comes from collecting revenue in the form of taxes and fees and from borrowing by issuing bonds. The revenue collection comes from a number of different sources and is divided into several funds, depending on where the money comes from and how it will be spent. State and federal laws determine which money can go into which fund and how each fund can be spent. Some sources of revenue, such as federal funds and permanent funds, are designated for specific services and programs. The main fund—the general fund—is the state’s most flexible pool of money because it can be used for any legal public purpose. We’ll be focusing on the general fund because that’s the pool of money that supports the state’s operating budget, which is the annual spending for ongoing programs and services such as schools and colleges, public health and hospitals, our court system and public safety, and more. The operating budget for the 2017 fiscal year was $6.2 billion, but cuts made during a special session in 2016 brought it down to $5.6 billion. The state also has a capital budget, which funds one-time expenditures such as building new schools and community centers. The development processes for the two budgets are different. This guide focuses on the operating budget and its main source of funding, the general fund. Some of the other funds are listed in the blue box. Most states and the federal government keep track of their indirect spending—the spending that’s done through tax credits, exemptions, and deductions—with a tax expenditure budget (TEB), which looks not only at how much these expenditures cost each year but analyses them for their effectiveness. In other words, to see if they are having the economic or social impacts they were expected to have. New Mexico does produce a tax expenditure report but it both lacks a comprehensive list that accounts for the cost of these credits, exemptions, and deductions and lacks any analysis as to their effectiveness. Indirect spending—or spending through the tax code—is explained in greater detail in our Citizen’s Guide to New Mexico’s Tax System. The vast majority of general fund revenue comes from taxes. The state collects different taxes from different sources. Some revenue comes from taxes we pay on the goods and services we purchase. Some comes from our personal income and the profits of corporations. Some comes from public resources, such as crude oil and natural gas that are extracted from our land. A very small amount of revenue comes from gaming compacts with tribal casinos and fees for things like driver’s licenses. For a more complete picture of state revenue sources, please see the Citizen’s Guide to New Mexico’s Tax System. General fund expenditures are expected to keep up with current services—that is, we want to be able to offer the same levels of services year after year. That means the current services budget should grow, on average, by about 5 percent annually in order to keep up with inflation (which is about 3 percent) and population growth (2 percent). We’ll also have to retain the current level of government employees in order to continue to serve the same number of public school students, Medicaid recipients, state prisoners, etc. State budgets may also grow in order to address new or emerging needs. General Fund – Money used for operating programs and services like public school education. Permanent Funds – Pools of money earned mostly from the state’s natural resources and interest on the investment of the funds. Reserve Fund – A “rainy day” fund for use when revenues are much lower than expected or for unanticipated spending needs. Road Fund – Money for building and maintaining transit systems, roads and highways from revenue source such as gasoline taxes. Unemployment Insurance Trust Fund – Money used to pay unemployment benefits to workers who have been laid off. Employers support the fund through the payment of insurance premiums. Federal Funds – Federal money that supports specific programs such as Medicaid. This money does not go into the general fund but is part of the operating budget. Operating Budget – The budget that determines recurring spending, such as operating programs and services like public school education, and some nonrecurring spending. Operations money comes from the state general fund and from federal funds. Capital Budget – The budget used for nonrecurring spending, such as building schools and community centers. This spending is referred to as “capital outlay” and can be borrowed, often through the issuing of bonds. Current Services Budget – The amount of money needed to offer the current level of services. The amount increases every year because of population growth and inflation. Tax Expenditure Budget – An accounting (usually annually) of the cumulative cost of all tax expenditures (tax credits, deductions, and exemptions). The operating budget is made up of the separate budgets of the state’s various agencies. Each state agency may have separate program budgets within their overall budgets. For example, the Human Services Department (HSD) oversees the health care program Medicaid, and Medicaid has its own budget within the HSD’s budget. However, in some agencies many programs are combined into one budget. For example, the Children, Youth and Families Department (CYFD) oversees the state’s foster care program, but that program does not have its own budget—the foster care program is simply part of a larger program budget within the CYFD. Executive and legislative initiatives to either expand existing programs or create new programs based on newly identified priorities. This is one area where citizens can and should exert their influence. State agencies, like HSD and CYFD mentioned before, begin developing their budget requests more than a full year in advance of the fiscal year in which the budget will be used. So agencies are already beginning to formulate their budget proposals for the next fiscal year before the start of the fiscal year for the budget that was just enacted. For example, agencies started developing their budget proposals for fiscal year 2018 (FY18), which runs from July 1, 2017 to June 30, 2018, in June of 2016—13 months before the fiscal year even begins. This makes estimating spending needs tricky. The State Budget Division (SBD) of the Department of Finance and Administration (DFA) releases budget preparation instructions to state agencies every year on June 15, as required by state law. Larger agencies often start developing their budget for the upcoming fiscal year even earlier. Agencies must submit their budget requests on September 1 to the governor (via the SBD) and the Legislative Finance Committee (LFC). At this point, the SBD and the LFC begin separate budget development processes that will result in two independent budget recommendations. However, during this time, there is often close coordination between the two staffs on technical issues related to the budget. Public education is the largest share of the state’s operating budget. That’s because of the way we fund education, not the overall amount we spend on it. In most states, education is funded primarily with local (city and county) property taxes. New Mexico’s funding system is much more centralized, with the vast majority coming from state income and gross receipts taxes. Hawaii is the only other state with a similarly centralized tax system. In order to develop a budget proposal, the governor and Legislature must have an idea of how much money will be available. So they rely on revenue estimates. The amount of money available for agency budgets can vary from year to year as a result of economic conditions, changes in tax law, and other factors. While the estimates are based on tried-and-true forecasting methods, they are also uncertain. Economic conditions can change between the time the budget is developed and when it is implemented. State agencies must always be ready to adjust their budgets based on actual revenue collections versus what was estimated six or twelve months before. New Mexico has a consensus forecasting process to ensure that both the governor and Legislature use the same estimates in developing their budget recommendations. The forecasting group provides consensus estimates for general fund revenue. Fiscal Year – The revenue and budget year for the state. New Mexico’s fiscal year starts on July 1 and ends the following June 30. The fiscal year is named for the calendar year in which the fiscal year ends. For example, fiscal year 2017 (which began July 1, 2016) ends on June 30, 2017. Fiscal year 2017 is abbreviated as FY17. Revenue Estimates – An educated guess as to how much money will be available for the state to spend in an upcoming year. In New Mexico, revenue estimates are released every quarter. Consensus Forecasting – The process used to enable experts from different departments to come up with an agreed-upon revenue estimate that is given to both the executive and legislative branches. The group that creates the consensus revenue estimates is made up of career economists from the DFA, the Taxation and Revenue Department, the Department of Transportation, and the LFC. The group generally meets four times a year and their estimates are used both during the budget development process and during the legislative session when the budget is being finalized. This forecasting group also tracks ongoing revenue collections to monitor whether enough money is coming in to support the current budget. In most states and in the federal government, the executive branch develops a budget proposal that is then debated and revised by the legislative branch. This kind of budget process gives the executive branch significant power because their document frames the budget debate. While the power to appropriate—that is, to authorize spending—lies with the legislative branch, the detailed review and analysis that is contained in the executive budget proposal reinforces the executive branch’s ability to steer the debate. Not so in New Mexico, which is one of the few states in which both the executive and the legislative branches produce budget proposals. The Legislature has its own committee that independently develops a budget proposal based on the same agency requests that are submitted to the governor’s office. This structure significantly increases the power of the Legislature in the budget process; the Legislature is not simply adjusting the governor’s budget, but is suggesting its own priorities. The governor must submit the executive budget recommendation to the Legislature in early January. The governor’s budget recommendation usually takes the form of two separate documents: the Budget in Brief and the Executive Budget Recommendation. The Budget in Brief is usually released during the first week of the legislative session. It highlights the governor’s major priority areas for the budget and includes nonrecurring appropriations, which are one-time expenses for things such as special projects and upgrades to information technology. The Executive Budget Recommendation is released earlier and contains recommendations for recurring appropriations, which fund ongoing services and programs, for every state agency. The State Budget Division (SBD) does not conduct public hearings regarding the executive budget. The governor may choose to indicate some of his or her priorities through press releases and public appearances, but the overall executive budget development process is almost entirely internal. SBD staff members review the agency requests for both recurring operating expenses as well as nonrecurring expenses. The SBD’s staff develops its own recommendations regarding proposed funding levels. These are reviewed within the DFA and approved recommendations are then presented to the governor. The governor makes the final decision on all executive budget recommendations. The recommendations can be either general or very detailed depending on the governor. Some governors approve budget recommendations in large blocks—such as “the judiciary,” “boards and commissions,” etc.—based mostly on staff recommendations, while others review and approve the budget for every agency. Each governor also decides how much state agencies will be involved in final budget decisions. Under some governors, agencies know the final recommendations and can appeal decisions before the budget is released. Under other governors, agencies will not know the final recommendations until the budget is officially released. When the Executive Budget Recommendation is released, paper copies must be provided to members of the Legislature and each agency. Limited paper copies are made available to the public, but an electronic version is available online (see Resources). Recurring Appropriations – Funding authorized for ongoing operations of an agency that will form the basis of the agency’s budget for the next fiscal year. Nonrecurring Appropriations – Funding that is only available on a one-time basis. The Legislative Finance Committee—an interim, bipartisan, bicameral committee—conducts public hearings as part of its budget development. The LFC holds monthly meetings from September to December to review each agency’s budget request. The LFC staff reviews the agency budget requests and prepares preliminary recommendations for both recurring and nonrecurring appropriations. These are reviewed internally and then provided to the members of the LFC in preparation for the public hearings. At the public hearing, the person who heads each agency presents their agency’s budget request to the committee. Although LFC budget hearings are public, they rarely allow for public comment. Public lobbying for budgetary issues must begin much earlier in the budget process. For more on advocating for budgetary issues, see the companion publication, Advocate’s Guide to the New Mexico State Budget. The LFC makes its final decisions in December, after which no changes are made. The budget recommendation is generally known as the LFC Recommendation. Paper copies are provided to the Legislature and the governor. Few paper copies are available to the public, but an electronic version can be found online. The LFC must release its budget recommendation no later than the first week of the legislative session. Recommendations are usually broken into three volumes: Volume I is the policy discussion and issue overview, and it includes recommendations for nonrecurring funding; Volume II includes the recurring operating budget for every agency; and Volume III provides data to back up the recommendations. Interim – Meeting between regular legislative sessions. Bipartisan – Including members from two parties or factions. Bicameral – Including members from both chambers of the Legislature: the House of Representatives and the Senate. Joint Rule – A rule adopted by both chambers in a legislative body. When the Legislature meets for its regular session in January, it has two separate budget recommendations to consider—the one the Legislative Finance Committee developed and the one proposed by the governor. To assist the Legislature in its review, the staffs of the LFC and the State Budget Division meet and prepare “difference sheets.” These sheets look at the differences between the two budget recommendations for each agency as well as each budgeted program within each agency. Difference sheets are presented at public hearings to the two committees that hold hearings on the budget proposals—the House Appropriations and Finance Committee (HAFC) and Senate Finance Committee (SFC). Every movement of the budget process is governed by deadlines established in state law by legislative joint rule. The legislative chamber that initiates the General Appropriation Act (usually the House) must transfer the bill to the other chamber within a certain allotment of days; that legislative chamber also must act upon it within a certain time frame; the GAA must then be approved by both chambers and transmitted to the governor by another predetermined deadline. Usually this process takes one or two months, depending on whether it is a short or long legislative session. The budget must be introduced as a bill before the Legislature can officially consider the budget proposals. This is traditionally done in the House of Representatives. That bill—the General Appropriation Act—is referred to as House Bill 2 (or HB 2) and is usually introduced during the first week of the legislative session. This initial draft is based on the executive budget recommendation and is not broken out into specific agencies, but overall areas such as “legislative branch,” “judiciary,” and “health and human services,” instead. This is because the initial HB 2 is merely a first draft that will be changed several times during the session. A “junior” appropriations bill provides funding for specific projects or initiatives by agency, though some of this funding can be added to existing agency programs. These bills usually incorporate funding proposals included in many stand-alone appropriations bills that have already been introduced, but can also include entirely new proposals. Such bills generally result from additional general fund revenue that is available above and beyond that used for the General Appropriation Act. As with all legislation, a bill does not go to the full House or Senate for a floor vote until it has been through at least one committee. The HAFC will hold hearings on every agency budget. At these hearings, the LFC and SBD budget analysts discuss the differences between the two recommendations. The agency head will present its request and stand for questions. There is usually no scheduled time for public comment, although occasionally an outside group or individual advocate will be allowed to speak. Advocates and citizens must talk one-on-one with members of the HAFC if they wish to try and influence the budget. The HAFC will usually vote to adopt one of the two budget recommendations, possibly with modifications. If there are outstanding questions or particularly complicated budgets, the committee may table the budget decision—meaning that it will review the budget internally and take a final vote later. The last of these HAFC meetings is often called “catch-up, clean-up.” This is the meeting in which all the budget decisions are finalized, including those that had been tabled. Agency representatives and interested groups also attend this hearing in case the committee has questions. Once HAFC finalizes its recommendations, the original HB 2 is substituted with a revised bill to reflect these recommendations. At this point, other stand-alone appropriations bills are incorporated into HB 2. These include: The Education Appropriation Act; The Department of Transportation Appropriation Act; The State Fair Commission Appropriation Act; the Department of Game and Fish Appropriation Act; and a bill for public employee salary increases if they are proposed. All these bills will have had separate hearings before being reported to HAFC and added to HB 2. Hundreds of other stand-alone appropriations bills will be introduced, but if the spending proposed in them is not included in HAFC’s version of HB 2, there is little likelihood that these stand-alone bills will receive any further consideration by HAFC. An exception is in years where there is enough funding for a “junior” appropriations bill. In these cases, HB 2 will go to the House floor for approval. Only rarely are amendments made from the floor. Usually it is passed “as is” and sent on to the Senate for consideration. The Senate Finance Committee budget process starts before HB 2 has been received from the House, with the SFC also holding budget hearings. However, in contrast to HAFC, the SFC often only hears the budgets of major agencies and those agencies headed by elected officials (such as the Secretary of State and the Attorney General’s offices). At these hearings, the LFC and SBD budget analysts and the agency heads are present. The format may follow that of HAFC hearings, but often the discussion focuses more on question-and-answer sessions with the agency. There is usually no scheduled time for public comment, although occasionally an outside group or individual advocate will be invited to speak. As with the HAFC, advocates and citizens wishing to influence the budget must talk one-on-one with members of the committee. At these hearings, the committee will not vote to adopt specific budget recommendations. SFC withholds all public decisions until it receives HB 2 from the House. Once HB 2 is sent to the SFC, the committee initiates the amendment process. Amendments (or changes) can be proposed by senators and the governor. A group or individual can propose an amendment, but a senator must sponsor it in order for it to be considered. The public amendment process is usually limited to a 72-hour period. Staff of the SFC and LFC help legislative members and outside groups enter amendments into the official database. The SBD enters amendments on behalf of the governor. SFC staff review the amendments, the SFC considers them internally and then votes to adopt amendments at a public hearing. However, there is no public discussion of individual amendments and often a list of proposed amendments is not publicly available. Once the SFC finalizes its budget decisions, it releases its version of HB 2. Instead of a substitute bill, it usually takes the form of proposed amendments that replace all the sections of the bill containing appropriations. Once the SFC amends HB 2, it’s no longer identical to what was passed by the House. The House can do one of three things: accept the amendments; ask the Senate to withdraw their amendments; or send the bill to a conference committee where members from the House and Senate work to develop a compromise bill. All conference committees held for the purpose of discussing public business are open to the public. (Excluded from this requirement are meetings dealing with personnel, adjudicatory, or investigative matters, as well as proceedings related to ethics and conduct or to a caucus of a political party.) In general, the compromise bill will include elements from both bills but occasionally entirely new appropriations are included during this process. Once the conference committee finalizes its recommendations, it releases its version of HB 2, which again takes the form of proposed amendments that replace all the sections of the bill containing appropriations. As set forth in the state constitution, the full Legislature meets only once a year. In odd-numbered years, the session lasts 60 days, during which all types of legislation are considered. In even-numbered years, the session lasts 30 days, during which only the following types of bills are supposed to be considered: fiscal and revenue bills; bills from the previous session that were vetoed by the governor; and bills introduced by special message of the governor. The conference committee version of HB 2 then goes to the House and Senate floors for approval—or final passage—by majority vote. At this point, amendments from the floor are prohibited by joint rule. Once both the House and Senate approve HB 2 it is sent to the governor for his or her signature, as per the state constitution. If the bill is passed any time before the final three days of the legislative session, the governor only has three days to act on the bill. If the governor does not act within that time frame, the bill is automatically enacted. If the Legislature sends the bill to the governor during the last three days of the session, the governor has 20 days after the close of the session to act on the bill. In New Mexico, the governor has line-item veto power over appropriations bills. This means that the governor can strike out individual appropriations as well as language in the bill. Unless the Legislature overrides the veto through a two-thirds vote of both chambers, these vetoes are final. While the Legislature has the sole power to appropriate, the veto gives the governor the power to take away or reduce appropriations. However, there are limits to the governor’s line-item veto power, but these limits are beyond the scope of this guide. The governor receives recommendations for line-item vetoes from his or her staff, the SBD, executive branch agencies, and other interest groups. Once the governor makes final decisions on line-item vetoes and signs the bill, the General Appropriation Act is enacted. If the bill is enacted during the 20-day signing period when the Legislature is already out of session, a veto override is possible only if the Legislature calls itself back into an extraordinary session, as outlined in the state constitution. Even though the budget has been enacted, it cannot be implemented until it is translated into an operating budget for each agency. While this may seem straightforward, given that agencies’ budgets were already appropriated in the General Appropriation Act, establishing an operating budget can take up to two months. This is because most agencies must translate the appropriated program budgets into division-level budgets. Also, the GAA often includes modifications to agency budgets such as salary increases and across-the-board reductions to general fund appropriations. Other modifications have also included reductions for new purchasing agreements and telecommunications rate reductions. Agencies often also revise their federal funding amounts in the operating budgets. Therefore, an agency’s final operating budget will often look slightly different from the direct appropriations provided to the agency in the GAA. Operating budgets pass through the Department of Finance and Administration for final approval and must be in place before the start of the new fiscal year on July 1. There is currently no public document that shows agency-specific operating budgets as finally implemented. A higher-level overview of the enacted operating budget is always available through the LFC’s Post-Session Review, which is a summary document usually published a month or two after each legislative session. The DFA occasionally provides an overview in its general fund report. The public can also obtain these documents thanks to the Inspection of Public Records Act (IPRA). Our budgets are the primary mechanism for how we accomplish collective goals. They are also how we address problems and threats to the common good. Budgets are a reflection of our values and an illustration of the kind of communities we wish to create. Our government is the mechanism through which we accomplish things that benefit us collectively. It’s how we build public infrastructure and systems like roads, bridges, and water lines. It’s how we educate our children, advance public health, and uphold our laws. In short, we use government to manage many of the aspects of our complex society that we could not manage as individuals. Together, these public commons and government services form the foundation for our economy. We can greatly improve our economy and overall well-being by investing in our strengths and resources—especially our human capital. Investing in our people not only makes our families and communities stronger, it also helps our businesses grow and thrive. Investments require adequate revenue, however, and how we choose to collect that revenue says as much about our values as does our budget. The decisions about our budget are made by the same people who make decisions about how to raise revenue. These people, as elected representatives, work for us. So it only makes sense that they hear from us about our priorities, our values, and what kind of New Mexico we want to create. For more information about how to advocate about the policies that are important to you, please see our Citizen’s Guide to Legislative Advocacy in New Mexico. This guide has been designed to invite citizens into a deeper understanding of our state budget—its purpose, how it’s built, and how it forms a foundation for our economy. Though the budgeting process may not be efficient, it is necessary so that our 112 legislators and one governor can interpret and address the needs, priorities, and values of all New Mexicans. With a better understanding of the specific processes and time lines for developing the state budget, we hope that watching it unfold in “real time” will seem a bit less confusing and messy, and that citizens will be able to better appreciate how it provides a structure for discussion and consensus-building about the best use of the state’s dollars to serve New Mexicans. 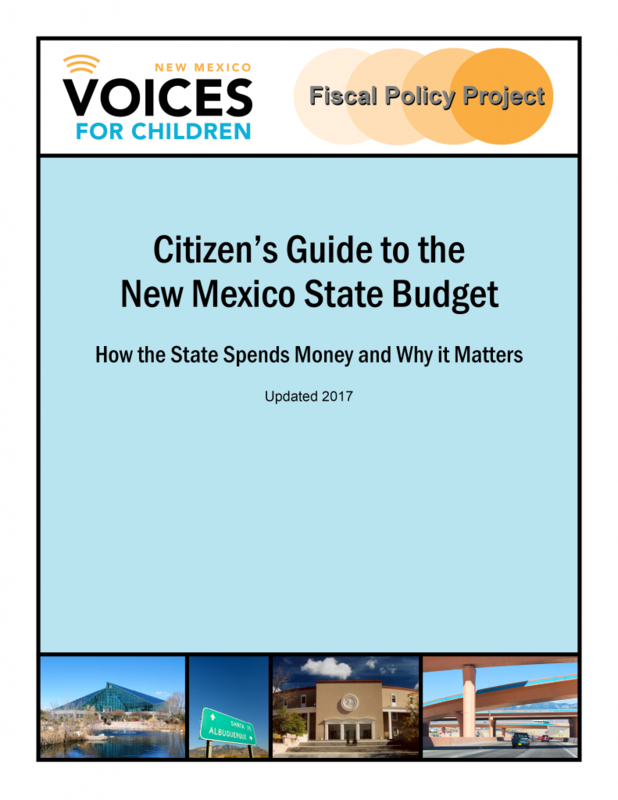 A companion guide, Advocate’s Guide to the New Mexico State Budget, provides more information on how you can become involved in helping to set the state’s budget priorities.